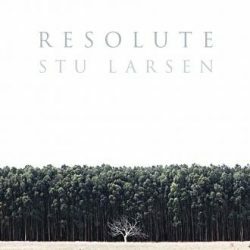 Australian native and notorious traveller Stu Larsen returns with his second full-length album ‘Resolute’ following his 2014 release ‘Vagabond’ which saw his brand of folk-pop gather praise for it’s simplicity and it’s lyrical honesty and he continues down the same path on his newest release. The most notable thing about Stu Larsen’s music is the seemingly quintessential British accent evident throughout which is unexpected from an Australian, and being a friend and touring partner of Brighton’s Passenger, the comparisons between the two are too easy however, Larsen brings a certain innocence and relatability to the table which sets him apart from the majority of the singer-songwriter genre. Lyrically throughout, Larsen adopts a colloquial approach and at times, you feel like you’re listening to someone regale stories of their travels on opener Aeroplanes or the time they met a future co-performer on Chicago Song and it’s this that really sets him apart from the competition. The first real album highlight I Will Be Happy and Hopefully You Will Be Too has an almost nursery rhyme feel to its infectious hook which dances along the guitar line and is an ode to all the things he’d like to do with his life whether learning japanese or doing karaoke – it all feels very relatable. The song’s on ‘Resolute’ are kept simple and are predominantly built around a simple piece of acoustic guitar which really allows both the lyrics and the melodies to take centre stage, and largely aided by the crystal clear production, as there isn’t a track of the ten available which doesn’t worm it’s way into your brain and stay there for the rest of the day and it’s evident that Larsen has a gift for not only creating great choruses but catchy verses too and it wouldn’t be a surprise to hear him all over the radio off the back of this release. What’s a Boy To Do is the first track of three to experiment with a more rounded, full-band sound and each one features just enough piano, drums and backing vocals to bring the track to life without being intrusive or taking away from the gentle nature of the record. Each of these tracks are dispersed equally throughout the album (Track 5, Going Back to Bowenville and track 9, The Straight Line) which serves to provide variety and saves the song’s from blending into each other and the latter, see’s Larsen at his most vulnerable but also his best. Overall, Stu Larsen has created a beautiful, vulnerable slice of pop perfection with enough variety to keep you interested, enough hooks to keep the masses listening and if there’s any justice in the world, he will be a household name in no time.